Inserting a spot marker in a text string in an object area enables you to separate the string into items that can be styled or aligned individually. You can insert a spot marker for this purpose in any object area. Select Show Markers from the View menu to display spot markers. Place the cursor in the position at which to insert a spot marker. 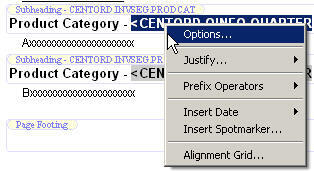 Right-click the object area and select Insert Spotmarker from the context menu. Report Painter inserts a spot marker to the right of the cursor. A spot marker looks like <+0>. To style an individual item in a text string, highlight a portion of the text string in the object and use the Font toolbar to adjust the Font Name, Font Type, and Font Size. For additional styling options, highlight the entire item, right-click, and select Options from the context menu. The Properties dialog box for the object opens at the Style tab, from which you can style the background color, font color, and so on. Note: You must use spot markers when changing the font color portions of text in a heading or footing. Spot markers denote the start and end of the text that is being modified. To align an individual item in the text string, highlight the entire item, right-click and click Alignment Grid. Then right-click an area in the grid and select Alignment Options. Choose the desired alignment options. For more information about using the Alignment Grid, see Aligning Fields and Text in Headings and Footings. In the following sample procedure, a spot marker is inserted in the page heading text to separate it into two items (Quantity Over and 400,000), which are then styled individually. In the following sample output, Quantity Over appears in bold, while 400,000 appears in bold italic. You may selectively style individual items in the subheading and subfooting object areas by using the Properties for Subheader (or SubFooter) dialog box. Style and Drill Down options, similar to the Field Properties dialog box, are available for subheadings and subfootings. To add a subheading or subfooting to a report, select the sort field from the Report Painter window. Click the SubHeading (or SubFooting) button on the Headings and Footings toolbar. Click Subheading (or Subfooting) from the Insert menu. A Subheading (or Subfooting) object area is added to the Report Painter window. Position the cursor in the subheading (or subfooting) by clicking your left mouse button in the subheading (or subfooting) object area. Type the subheading (or subfooting) text. Place the cursor in the subheading (or subfooting) where you want to embed the value. Double-click a field from the Fields list in the Object Inspector. The field is embedded in the subheading (or subfooting) object area. To style an individual item in a subheading or subfooting, highlight the selected item, right-click and click Options from the context menu, as shown in the following image. The Properties for Sub Header (or SubFooter) dialog box opens. Use the Style, Drill Down, and Images tabs to style the individual portion of the subheading (or subfooting), as shown in the following image. Note: If you are only using text in the subheading (or subfooting), you can format a portion of the text string by using the Font toolbar.